There are super music festivals all around the world and now I’ve experienced at least part of Oulu Music Festival. Performers are famous and for a good reason. They are really from the top. And I’m thrilled because I have to admit I never heard of this festival before. Why? Well, I believe because I’ve lived in all other places and all in Oulu is quite new for me. For example in Tallinn is also very famous Tallinn Music Week and I’m sad that I didn’t (have time to) go to see so many things there during this festival. And Tallinn is also full of every kind of events and luckily I experienced quite many of them. So I’m happy that this week I’ve seen already two great concerts here in Oulu. On Thursday Pekka Kuusisto played with Oulu Sinfonia (one of my favorite) violin concertos by Sibelius. I have heard it few times live and played also myself. This time it was played with modern dance choreography. That was also one of the reasons for me to see it. I kind of like this approach that people are seeking new ways of doing things. And I know that at the same time for other people it’s awful to think about mixing things. I had maybe higher expectations for dancing, but for some parts it was really good too. Still, Pekka Kuusisto took more of my attention. Today I attended another concert and got all-over-body-goose-pumps. Oulu All Star Big Band and Iiro Rantala, Jarmo Saari, Cæcilie Norby and Lars Danielsson. Especially I liked Cæcilie with her amazing voice! First song she sang was Joni Mitchell’s Both sides now and that was one of the first songs I was singing in Tallinn in my vocal lessons. Really made me miss my lovely vocal teacher. Although my education is mainly classical I really enjoy these other genres too. This concert really made me want to sing and play the bass and the saxophone. And perhaps gather some kind of band to play with me. Only this spring I should concentrate more on graduating with the clarinet (again). I also remembered my own big band experience. It was really only few days before the concert when I heard that one girl couldn’t play in the concert so she asked if I could go there instead of her to play the bass clarinet. There was luckily only few songs since that time I didn’t play the bass clarinet so much and I was a bit nervous. The concert was great and it was recorded. One piece had saxophone soloist playing and the last note was lasting forever to me. And it was quite a high note. As I was running out of air my note squeaked just when the piece finished. Of course right when I got the CD I had to listen for the squeak, but it was actually very mild and fading out so if you don’t know what to listen for maybe you will miss it. All in all, I want to be on the stage always after these kinds of concerts. And now I’m heading to listen some more by master class groups of these previously mentioned rythm music artists. This entry was posted in Uncategorized on March 22, 2014 by helipauliina. I’m just on my way back from a trip. I had my clarinets fixed in Lahti by RoHi oy. I’m not sure when was the first time I travelled with my instrument. 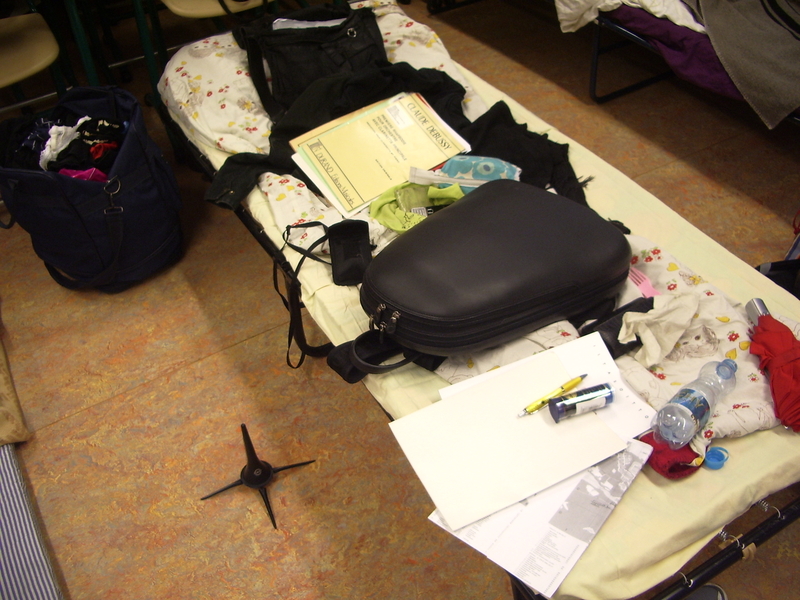 For sure after my studies in Tampere began, the travelling with instruments became one significant part of it. I believe that I have learned how to pack very efficient way and one of the recent cases was flying from Oulu to Oslo for an audition with only hand luggage for one weekend. And this included three clarinets in two bags and everything else I needed for this couple of days, like a dress and shoes. Nowadays I enjoy travelling light and for sure those few times I don’t need to take my instruments with me. Usually there is some concerts involved so it means also taking the concert outfit with me. For ladys it’s usually easier with light dresses compared to men’s suits but on the other hand women need a lot more other stuff. Or do they? Quite many times the trip is at least one week long and once even three weeks long. There’s always a small hurray if I don’t have to take my sleeping bag or sheets with me. I’m happy that clarinets fit in quite small space. Big instrument players for sure are not always happy to pay an extra seat when flying. Once I experienced a nightmare of every musician: I forgot my clarinets in the bus. But I was extremily lucky, because after realizing that something is missing after aobut half an hour, I rushed back to the bus terminal in Helsinki and tried to find the bus. All drivers I talked to thought first that I was late from a bus. But finally I found the driver of the other bus that also came from Tampere about at the same time (quite weird) and he said he might get into the bus where my clarinets were trapped. I was for sure ready to wait until the other driver would come back from his break, but luckily the door opened and my babies were safely in the upper self waiting for me. Whenever travelling I always notice other musicians because of their instruments cases. Then I try to see if I happen to know them or just smile understanding. This entry was posted in Uncategorized on March 7, 2014 by helipauliina.